Mitt Romney said he’s not concerned about the very poor because they have a safety net. And if the safety net needs repair he’ll fix it. This proves he doesn’t care. If he thinks the safety net is OK he’s out of touch, and his out-of-touchness proves his lack of concern. The safety net leaves millions of minimum- or low-wage earners without enough to feed, clothe, and shelter their families, leaves them dependent on emergency room visits for any medical care, and—if they’ve been unemployed for a long time—facing termination of their unemployment checks. And candidate Romney, along with nearly unanimous Republican Senators and members of Congress, are reflexively opposed to “fixing” the safety net. But appearing so heartless can be costly to a Presidential candidate. So Romney tried to lie his way out of it, saying he misspoke. But he didn’t misspeak. Misspeaking is when I call my granddaughter by her sister’s name. Misspeaking is when John McCain tells a Romney gathering that he’s confident that President Obama will cure the nation’s ills. Misspeaking is not saying something, then when challenged explaining what you said. He didn’t misspeak. The candidate told CNN’s Soledad O’Brien on Wednesday that he’s “not concerned about the very poor,” explaining that he’s concerned about the middle class. 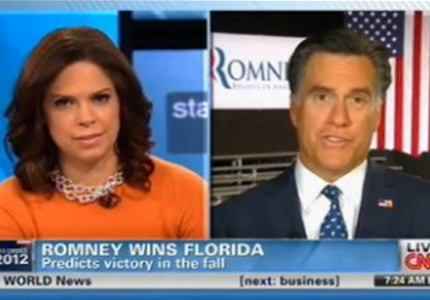 Yesterday Romney told Nevada political reporter Jon Ralston that he didn’t mean any such thing. “It was a misstatement. I misspoke. I’ve said something that is similar to that but quite acceptable for a long time. And you know when you do I don’t know how many thousands of interviews now and then you may get it wrong. And I misspoke. Plain and simple. When Mel Gibson and Michael Richards let loose with vile racist and anti-Semitic rants they tried to lie their way out of it: “I misspoke.” They didn’t misspeak. Neither did Romney. This entry was posted on February 3, 2012 at 10:11 pm and is filed under Apologies, Ethics-general, Government, hypocrisy, Politics. You can follow any responses to this entry through the RSS 2.0 feed. You can leave a response, or trackback from your own site.